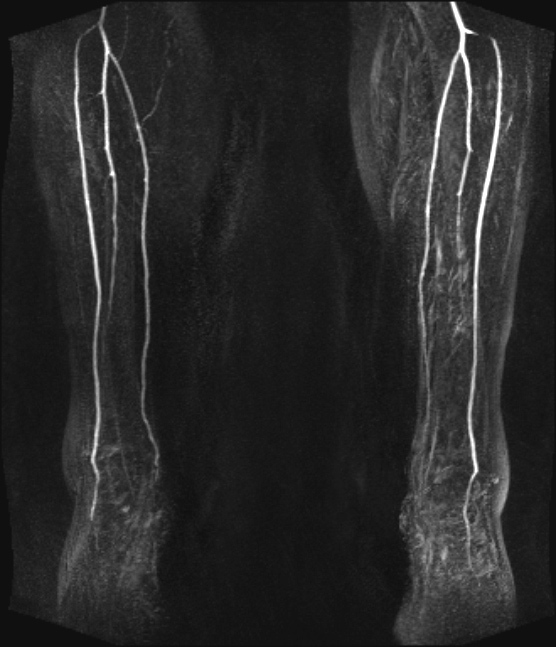 This 63-year-old man presented with a longstanding history of peripheral arterial occlusive disease, hypertension, diabetes, coronary artery disease, prior myocardial infarction, crossover bypass, and renal artery stenosis with increasing leg pain. Multifocal stenoses of the lower extremity vessels, superficial femoral artery stenoses, renal artery stenosis, occlusion of the pelvic axis. Scans were acquired at 3 T on a Tim Trio system, using one body matrix and a dedicated 32-element PA-matrix coil. Bolus timing was used, employing 1 ml of contrast. For the exam itself, 14 ml of gadolinium chelate was administered at a rate of 1.5 ml/sec. This was followed by a 25 ml saline flush, administered at the same rate. The scan parameters (for the 3D volume gradient echo acquisition) were TR/TE 2.43 msec/1.02 msec, with an almost isotropic voxel size of 1.2 x 1.2 x 1.3 mm3 and a scan time of 1:02 min:sec (acquired during breath-holding). Parallel imaging was utilized (GRAPPA), with an acceleration factor of 2. 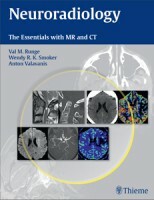 The MRA was acquired during continuous table movement (TimCT) over a large FOV of 140 cm (A). Five minutes after the MRA acquisition an additional time-resolved MRA (TWIST, TR/TE 2.75/1.12 ms, voxel size 1.1x1.1x1.1 mm3, temporal resolution 5.5 sec) was acquired. For the time-resolved MRA, 4 ml of contrast agent was injected at 1.5 ml/sec followed by a saline chaser of 25 ml injected at the same flow rate. The delay between the injection of contrast agent and the start of the time-resolved MRA was set to 7 sec (B, C). Before contrast administration, an investigational non-enhanced native SPACE sequence (D) (TR/TE 1193/34 ms, voxel size 1.4x1.4x1.3mm3) was acquired. This EKG-triggered sequence acquires images during systole and diastole, subtracts the diastolic from the systolic data set, with the resulting image only demonstrating the arterial system. 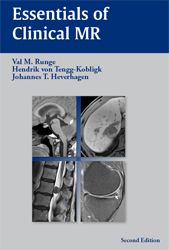 Patency of the femoro-femoral bypass is demonstrated on the TimCT MRA (A). The proximal part of the right superficial femoral artery is occluded and re-filled via a collateral vessel that originates from the profundus (deep) femoral artery. 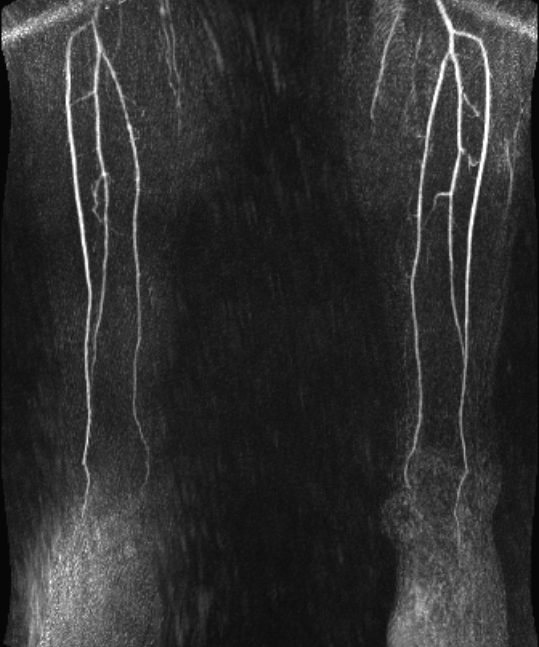 Inspection of the distal part of the left superficial femoral artery reveals a high-grade stenosis, followed by multiple intermediate-grade stenoses involving the P1 segment of the popliteal artery, but with good enhancement of the run-off vessels in the calf. 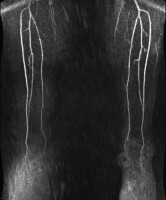 The right popliteal artery is also occluded over a short section, but sufficiently collateralized, with good enhancement demonstrated of the calf arteries. 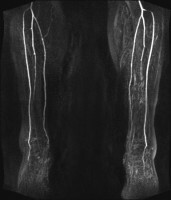 In the non-enhanced native SPACE MRA (D), the vessels of the lower extremity are depicted almost equivalently to the contrast-enhanced TWIST-MRA (B, D), however with an artifactual stenosis in the proximal left anterior tibial artery and non-depiction of the distal left peroneal artery.